Thoroughly explore the world-famous Golden Bridge from Da Nang at your own pace and expense! The best cure to urban fatigue is to escape the urban sprawl and head out into the fresh, clean atmosphere of the mountains! 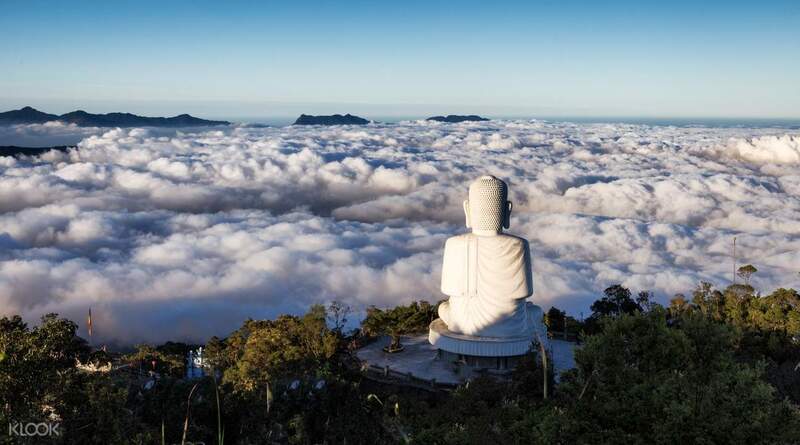 This Ba Na Hills Day Trip will bring you to the scenic sights and destinations of the locale, and give you a healthy dose of much needed mountain air. 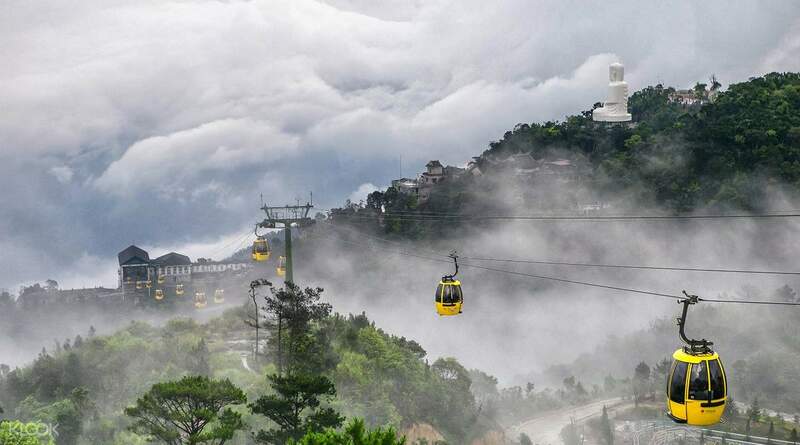 You'll first head to the Ba Na Hills cable car station where you'll ascend one of the world's longest and highest cable car rides, giving you panoramic views of the surrounding mountains. At the station, you'll get to see the Linh Ung Pagoda, Loc Uyen Garden and Quan Am Pavilion. Next stop is Debay Station where you can head into Fantasy Park for a fun-filled morning of games and exploration before having a sumptious buffet lunch. 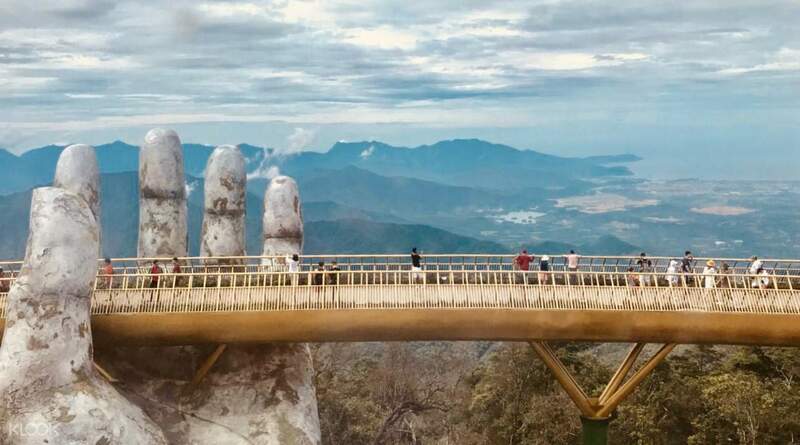 With a full belly, your guide will bring you the Monkey garden and finally to God Mountain, the highest peak in central Vietnam, before returning to Da Nang. Head up the mountain on one of the world's longest cable car rides! Enjoy free time and have fun in Fantasy Park! This place is in my Bucket List so I really feel great to be there. The Tour was great. They arrived on time in the hotel to pick us up. The Vietnamese food at Arapang was also great. The tour guide Phuoc was awesome to handle everyone of us & our queries. The driver is also nice. The place was nice & the weather was good. Such a good timing coz it’s not so hot & not so cold. It’s not even raining sometimes foggy. There’s still so many construction around so I guess maybe few years from now Ba Na Hills will become so popular & great. I love the Tulips around. This place is in my Bucket List so I really feel great to be there. The Tour was great. They arrived on time in the hotel to pick us up. The Vietnamese food at Arapang was also great. The tour guide Phuoc was awesome to handle everyone of us & our queries. The driver is also nice. The place was nice & the weather was good. Such a good timing coz it’s not so hot & not so cold. It’s not even raining sometimes foggy. There’s still so many construction around so I guess maybe few years from now Ba Na Hills will become so popular & great. I love the Tulips around. the tour was really great. when we went up to ba na hills, it was really foggy and we couldn't see the golden bridge well, but after a while, the sun came out and we had great view. also yje tour guide was super nice. she explained a lot about vietnamese culture, history, and so one. i do recommend this tour. the tour was really great. when we went up to ba na hills, it was really foggy and we couldn't see the golden bridge well, but after a while, the sun came out and we had great view. also yje tour guide was super nice. she explained a lot about vietnamese culture, history, and so one. i do recommend this tour. 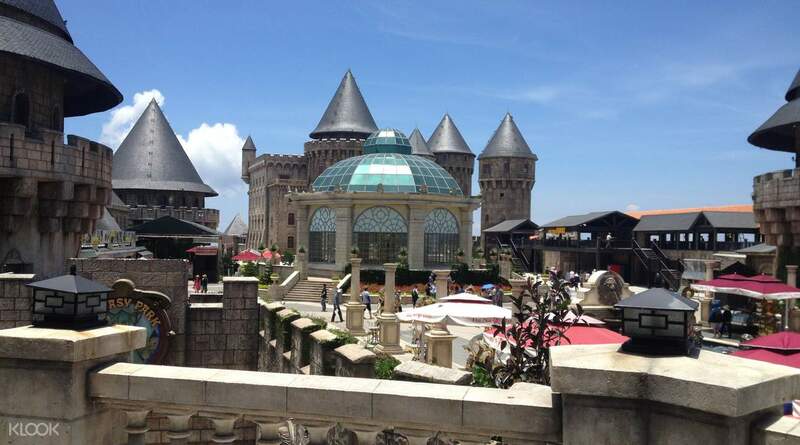 On the day that My family visited Ba Na Hills, it was raining!!! But we still find it very fun to be there. The cable car was stopped for a few second due to insufficient electric supply, but it’s just a few seconds, so no worry, you can enjoy the view. The buffet lunch provided was full of variety of food. It’s just that our luck was not that good that the haze and rain blocked our view of Golden Hand Bridge. On a rainy day, I would suggest to stay on top of Ba Na Hills longer so that kids can enjoy the game in fantasy park, since we hardly find a good scene to take photo at flower garden due to rain. On the day that My family visited Ba Na Hills, it was raining!!! But we still find it very fun to be there. The cable car was stopped for a few second due to insufficient electric supply, but it’s just a few seconds, so no worry, you can enjoy the view. The buffet lunch provided was full of variety of food. It’s just that our luck was not that good that the haze and rain blocked our view of Golden Hand Bridge. 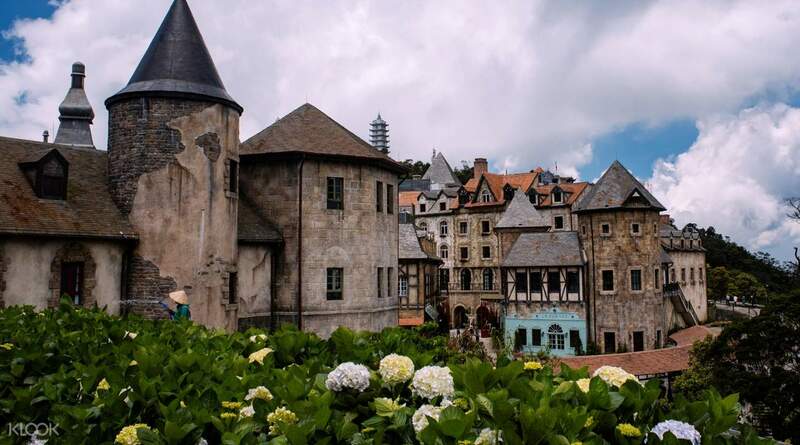 On a rainy day, I would suggest to stay on top of Ba Na Hills longer so that kids can enjoy the game in fantasy park, since we hardly find a good scene to take photo at flower garden due to rain. The staff will message you to ensure that you are clear with the itinerary. The trip are smooth and fun. We love the guide as he is friendly and funny. He will make sure the number of people before proceed to another spot and tell us some history of Bana Hills which is really good for tourists. He teaches us some Vietnamese language as well. A good experience with the trip. The staff will message you to ensure that you are clear with the itinerary. The trip are smooth and fun. We love the guide as he is friendly and funny. He will make sure the number of people before proceed to another spot and tell us some history of Bana Hills which is really good for tourists. He teaches us some Vietnamese language as well. A good experience with the trip. A good experience to join the tour. The agent had contacted us clearly by what’s app before the trip. The tour guide was nice and friendly. He was in good responsiblilty and gave clear introduction about Bana Hills. It could really save the time to find the places to visit if u had joined this tour. There was a heavy rain before we gathered together and the tour guide was so caring to prepare each one of us a plastic raincoat. The tour was in a resonance price. The lunch buffet was fair but still could try. Overall we all had a good experience and an enjoyable time to visit the Bana Hills by joining this tour. A good experience to join the tour. The agent had contacted us clearly by what’s app before the trip. The tour guide was nice and friendly. He was in good responsiblilty and gave clear introduction about Bana Hills. It could really save the time to find the places to visit if u had joined this tour. There was a heavy rain before we gathered together and the tour guide was so caring to prepare each one of us a plastic raincoat. The tour was in a resonance price. The lunch buffet was fair but still could try. Overall we all had a good experience and an enjoyable time to visit the Bana Hills by joining this tour. perfect trip, very convenient and on time. guide spoke good english and was well prepared both timing wise and planning and explaining which stops were which and where to meet up next. overall a fantastic experience to a breathtaking location! perfect trip, very convenient and on time. guide spoke good english and was well prepared both timing wise and planning and explaining which stops were which and where to meet up next. overall a fantastic experience to a breathtaking location! Our tour guide Minh is very nice and lovely girl. Tour was wonderful and the trip schedules arrangement was great . Our tour guide Minh is very nice and lovely girl. Tour was wonderful and the trip schedules arrangement was great .